the upcoming global standard connector for smartphones / tablets. The motor is integrated into each single wheel, which means that your board has a four-wheel drive and accelerates homogeneously. The trucks are completely cordless, which means that baseplate and hanger can simply be inserted into each other as usual. Through the induction coil, a smartphone can be charged according to quasi-standard QI by placing it on the base plate. At home the board can be inductively charged by a board suspension / mount (planned feature). The data exchange between the two axes and the smartphone or smartwatch takes place via bluetooth. The USB Type C connector is a global standard connector for smartphones / tablets. With it you can charge your e-truck battery or load your gadget on the road during a short break. Four high-performance industrial battery cells per axle provide power to your board. Spare batteries can be replaced by a few easy steps. The electronics are equipped with cell protection and charging balancing. The recharge time is designed for 500 charging cycles. We provide an one year warranty on this battery. The engine is integrated into each single wheel, which means that your board has a four-wheel drive and accelerates homogeneously. 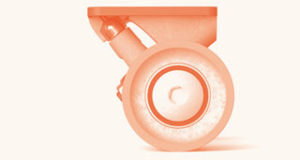 The combination of a well-thought-out motor and a patented winding ensures maximum efficiency and an one hundred percent freewheel, whereby manual driving is also possible. Regardless of whether the battery is full or empty. 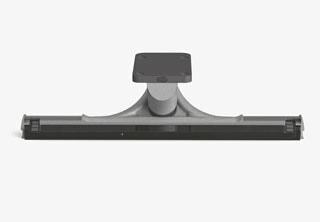 The axis is completely cordless, this means baseplate and hanger can simply be inserted into each other as usual. 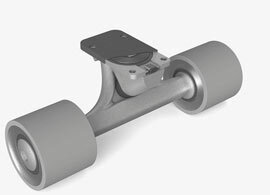 The casters and the ball bearing can be exchanged quickly and easily. To change it, open the outer plug with the enclosed tool. The outer ball bearing and the wheel can then be replaced. Both are available in our shop. The battery pack and the motor control are integrated into the hanger. The components are designed in the most efficient way in order to reach a high range while producing little waste heat. The e-trucks are made from high-quality aluminium alloy and serve as the housing and heat sink for the drive components. The truck is constructed without any cables, so no plugs or cables have to be connected. Instead the components connect themselves when assembled. 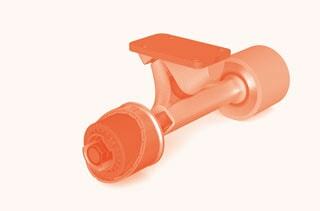 Wheels and bearings can be easly exchanged by removing the screw plug on the side. Replacement for wear material can be ordered soon in our onlineshop. USB type C port for charging the e-trucks with all battery chargers starting from profile 2. The charging speed depends on the profile (performance class) of the charger. In order to increase the battery life and maintain a high number of charging cycles, a slow charging mode of approx. 3 hours is applied by default. However, if you want to be back on board faster, you can choose the rapid charge mode. The rapid charging time is about 1.25 hours. The charger that comes with the e-trucks support profile 4. The USB port at the baseplate can also be used to charge electronic devices. It offers a maximum of 5V with 1.5 A. Induction coil for cable-free inductive charging of the e-trucks on a charging mount (planned feature). The induction coil supports Qi standard wireless charging, thus it can be used to charge your Qi compatible devices, like smartphones, by placing it on top of the baseplate. Bluetooth module, enabling the communication between the e-trucks and the remote control. A smartphone or smartwatch can also be connected which offers more information and settings to the user (requires the use of the JayKay app). NFC chip for connecting new truck remote control configurations and smartphones in a fast and easy way. Smartphones only have to be hold close to the baseplate.